The basis of this guide was a touring holiday through France in mid-summer 2000, when I lingered for a few days in the middle of the Loire Valley. The excuse was a truly wonderful hotel, some breathtaking scenery, and of course some rather good food and wine. The report was updated in late in 2002. New for 2002 is an extensive report by Andy Leslie, a regular visitor to wine-pages. When Andy sent me his perspective on a wine-lover’s holiday in the region, I asked his permission to add it and some great photographs as a second opion on this lovely area of France. Read Andy’s report here. On each occasion I based myself just outside the city of Saumur, famous for its sparkling wines and well situated for visiting both the excellent Cabernet Franc producers of Chinon to the south east, and of course the superb sweet wine producers of the Coteaux du Layon to the west. Many other famous wine regions like Vouvray and Tourraine are within easy striking distance. One of the nicest hotels I have stayed in is just a few miles to the West of Saumur along the D751. It is in, or rather above, the tiny village of Chênehutte-les-Tuffeaux. The hotel is reached by a narrow road that winds steeply from the village. The beautiful grounds contain the ruins of an 11th Century priory, and the hotel itself is an 18th Century Manor with 40 acres of tranquil woodland that contain a heated swimming pool, tennis court and many shady pathways.Bedrooms are individual, luxurious and extremely well-appointed. Public rooms are grand and elegant, yet not too formal. But the three things that set the hotel apart from many beautiful properties in the area are the quality of the staff, the kitchen, and the unique dining room and terrace. Meals are taken in an atomspheric dining-room with commanding views of the Loire. It really is a magnificent panorama and the light on the distant hills as the sun sets makes a wonderful backdrop to some seriously good food and wine. There is a full à la carte choice as well as seasonal and “typical” menus of the region. Dishes like medallions of monkfish, cooked to just translucent perfection and sitting on a meaty jus, studded with capers and sun-blush tomatoes, or a wonderful take on tarte tatin: an individual tart formed from a slice of fresh pineapple on a butter and almond sponge base, sweetened by caramel and served with a lime sauce and coconut ice cream. Breakfast can be taken on the terrace with the same stunning views. The Prieuré is a member of the Small Luxury Hotels of the World group and is, as you might expect, not cheap. Rooms start at around 900ff (£90/$150US) for a double. Breakfast and meals are not included. Dinner should cost around £40 ($60US) per person. As I say, not cheap, but the faceless chain hotels of central London will charge the same for cramped accommodation, dreadful food and couldn’t-care-less service. Another 10 miles or so further west, on the D953 heading along the Loire towards Angers, lies the final restaurant recommendation, Le Promenade. I stumbled into this one quite by chance one Sunday lunchtime and it was just a treat: a really old-fashioned and comfortable bourgeois restaurant that’s so typical of rural France. Inexpensive, yet very proper with crisp linen, sparkling crystal and fine Laguioli silverware, the food was perfect and simple: really good steaks with pepper sauce and buttery fondant potatoes washed down with a bottle of very good Anjou-Villages from Domaine Richou. Around £20 a head for a four course lunch including wine and coffees. Le Promenade is situated about a mile west of the small village of St-Mathurin-sur-Loire. Telephone +33 2 41 57 01 50. Just on the eastern outskirts of the city of Saumur are a number of sparkling Saumur producers who welcome visitors with attractive facilities. Now to be honest, once you’ve taken a tour of one cave full of slumbering bottles, you really have seen them all. But nevertheless I’d recommend the visit to Langlois-Château, though there are many good producers in the area. On the Langlois tour you will visit the caves, and be given a small introductory course on how wine is made (not just sparkling, as they produce a whole range of wines), including mini-lectures on terroir, the production of sparkling wine and how to taste. The visits are very well organised and welcoming. Langlois-Château is on the D75, in the suburb of St Hilaire – St Florent, just west of Saumur. Open every day, tours last around one hour and can be taken between 10:00 and 12:00, or 14:30 and 18:30. Telephone +33 2 41 40 21 40. Charles Joguet is one of the leading lights of Loire wine-making. His Chinon vineyards produce some of most profound Cabernet Franc wines of the region and are just 15 miles or so south east of Saumur in the village of Sazilly. Telephone +33 2 47 58 55 53. Appointments are advisable, as they are at Couly-Dutheilin Chinon itself. Be sure to see the cellars, carved deep into the rock-face. Telephone +33 2 47 93 94 59. The Chenins Blanc of Coteaux du Layon and the superior enclaves of Quarts de Chaume and Bonnezeaux are some of the greatest botrytis-affected sweet wines in the world. 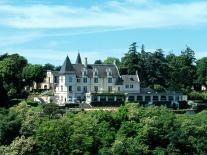 The region is rather tucked away, about 25 miles west of Saumur, but the drive is beautiful and there are some marvellous riverside spots for a picnic. Recommended visits are to Domaine Cady in Saint-Aubin-de-Luigné (Telephone +33 2 41 78 33 60) and to Château Bellerive in Rochefort-sur-Loire, a fine Bonnezeaux producer. Telephone +33 2 41 78 33 66. Again both domaines prefer prior reservations. In Saumur itself – a good sized town with plenty of life about it – there is a small Maison du Vin; a wine museum and shop. Closed for lunch when I visited and looking a bit dowdy, but perhaps worth a visit. Definitely worth a visit is the large LeClerc hypermarket just on the western edge of town at boulevard Delattre de Tassigny. LeClerc is always worth a look when you come across one as they have a pretty good wine selection that always reflects the local region. However, this is a very different kettle of fish indeed: “La Cave” in this store is a brand new concept for the chain, and one of only two in France. It is a wonderful temple of fine wine. On sale is not only a fine, fine selection of Loire wines, including sweet wines going back to the turn of the century, but all the Grands Vins of France, including every vintage of Mouton-Rothschild for the past 100 years! Prices on the most famous wines are nothing special, but there are bargains to be found and good advice as well as free tastings is available from the helpful and knowledgeable staff. I enjoyed a very interesting hour tasting and chatting to the very helpful Nick Pringent, and came away with some interesting stuff. I have every intention of returning to this area before too long, to stay again at the Prieuré, enjoy some excellent food and wine, and explore the vineyard regions a little more. The Cabernet Franc wines of the area have me intrigued: after tasting so many rather green and mean wines in the past, the recent fine vintages of 1996-1998 have produced sweet, ripe, vividly fruity wines that are cheap, and very drinkable. The sweet wines are amongst the greatest on the earth, so all-in-all, a very attractive destination for the wine lover.